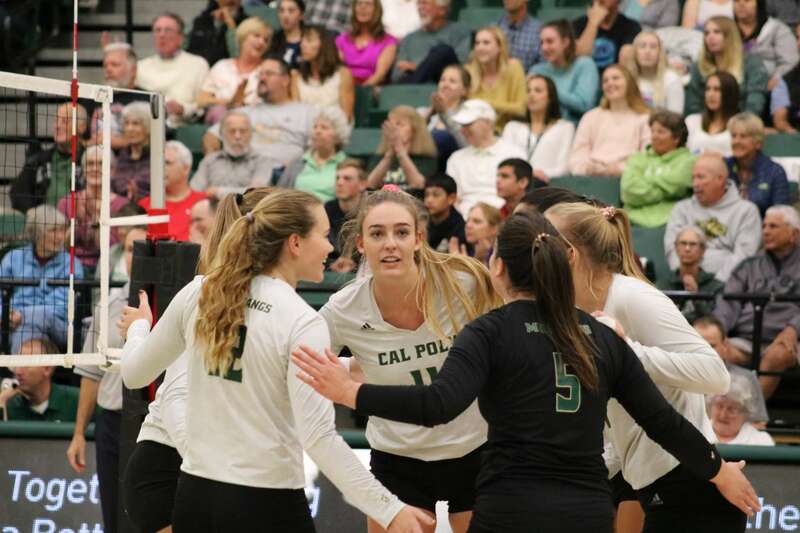 It’s win or go home for the Cal Poly Volleyball team this Friday, Nov. 30 at 6 p.m. against the University of San Diego at USC Galen Center. The Mustangs will head to the NCAA tournament for their second year in a row, after securing the Big West Conference championship in a 3-0 sweep over Cal State Fullerton. This marks the first time Cal Poly has held back-to-back Big West Championship titles since the 2006-2007 season. If the Mustangs (25-2, 15-1 Big West) take down the Toreros (15-12, 13-5 West Coast) Friday, they will play either Samford University or No. 11 USC on Saturday, Dec. 1 at 7 p.m. The Mustangs plan to bring in excitement and energy to their first – and possibly last – match against San Diego. The team has been watching film on their opponent and said they feel ready to take on the strong offense. Freshman middle blocker Meredith Phillips said the team has been watching a lot of the Toreros’ swings and studying which way they hit. Phillips said San Diego will bring on some hard hits. “I have to be ready to defend that and block that,” Phillips said. The Mustangs have been scrimmaging at practice with half the team mimicking San Diego’s typical plays to adjust their positioning and be ready for the ball. With a blocking average of 0.92 blocks per set, Phillips is ready to throw up her hands. This is the ninth straight year in a row San Diego will compete in the NCAA tournament. The Toreros’ most recent contest against Cal Poly was a sweep in 2012, with San Diego winning 3-0. Sophomore outside hitter Roxie Wiblin leads the team with 281 kills this season with a 2.75 hitting percentage compared to Cal Poly outside hitter Torrey Van Winden’s team-leading 466 kills and a hitting percentage of .365. Head coach Sam Crosson said he is proud of what the team has accomplished and expects to see them accomplish even more. “It’s a reward to able to watch the joy and the fun that these players get to see in a tournament like this,” Crosson said. Crosson said he relies a lot on the upperclassman and returners to make sure the team is working together. After going 15-1 in the Big West Conference, the Big West coach of the year for the second year in a row wants to see the team stay calm in tournament. The culture of the team and the tight knit bond the athletes have has allowed them to play cohesively throughout the entire season – they all have one united goal: to win. For senior outside hitter Adlee Van Winden, this could be her last game – but that is not the mindset of this three-time All Big West First Team Honoree. As the most experienced player on the team, Adlee Van Winden has appeared in all match sets this season and all 101 sets in the 2017 season. She said she is confident in the team’s ability to move past the first round. Adlee Van Winden said the norm of this season has been to “go out there and really act like you have nothing to lose.” The outside hitter said compared to last season they have a larger risk-taking mentality, and she wants the team to put their trust in the game.